Your bedroom is one of the most intimate room in your home and it should feel the most peaceful; after all this is where you rest. But peaceful and cosy doesn’t mean it cannot be elegant and timeless. Here are some of my tips to transform your bedroom into your own little sanctuary. Your room should reflect your personality, so by choosing a colour you love, it will naturally feel more inviting. However, bear in mind that some colours have the power to soothe and some have the power to agitate – So I would recommend choosing a soft palette for your bedroom; if you wish to obtain that peaceful look – If you really love strong colours, you can use it in decorative elements, such as art, flowers, a throw or accent furniture , etc… On that note, personally, in my designs I mostly use neutrals for bedroom walls. 4/ Invest in the bed! Mirrors always add depth to a room, which is good in a small space like the bedroom, but it also adds glamour and sophistication. You can also add a nice bouquet here and there, it will instantly brighten the space and add a pop of colour to a neutral room. You do not have to go minimalist, if it is not your style. But try not to put too many things in your bedroom. 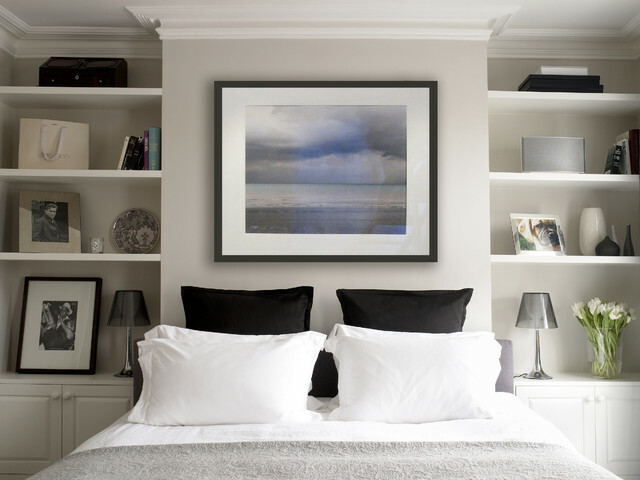 Not too many pillows, not too many pieces of furniture if you do not have the space, do not put to many things on your nightstands and dresser… The les cluttered, the more spacious and therefore, zen, it will feel! 9/ Carpet or no carpet? This one is my last point, only because, I personally am not a fan of carpeted floors. It feels very comfortable and it is noise-cancelling if you have easily upset neighbours. So yes, if you like carpeted floors then go ahead, but choose a soft and rich texture and neutral tones and it should go from wall to wall. If carpeted floors are not your thing either, a nice rug can do the trick to add softness to the room. It should be placed in a way that one part is under the bed and the other part, should stick out.